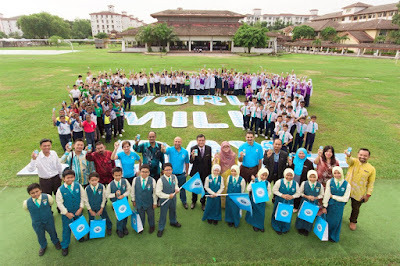 In the spirit of spreading the goodness of milk, Dutch Lady Malaysia celebrates World Milk Day this year by giving out 10,000 packs of milk to primary school children. 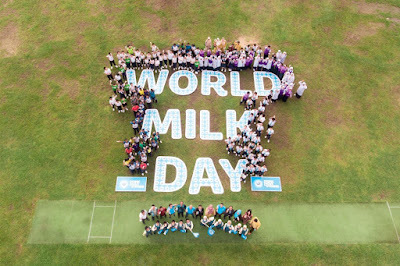 The celebration was held at Sekolah Kebangsaan Dato’ Onn Jaafar in Subang Jaya on 31 May 2018, where milk-loaded trucks were flagged off to deliver the nutritious beverage to schools. As it is currently the Ramadan season, Tarang highlighted the relevance of milk during the holy fasting month. “Milk and dates is an ideal food pairing for sahur during Ramadan. It provides school children with balanced nutrition to last through the day and prevent them from overindulging for sahur in the morning,” he said. The celebration kicked off in high gear at the Sekolah Kebangsaan Dato’ Onn Jaafar, where eye-catching trucks adorned in Dutch Lady’s signature bright blue colour embarked on their journeys to deliver 10,000 packs of nutritious milk. 30 to 40 percent of our children are not getting the right nutrition, with one in five of them are overweight or obese. “This has also brought to our attention, the rising concerns of non-communicable diseases (NCDs) in the world such as obesity, diabetes, hypertension and cancer, which has made our mission even more important to educate teachers, parents, and children on the importance of getting proper nutrition,” he said. “As such, we have been working hand in hand with the Ministry of Education, over the years, to invest in initiatives such as Jr NBA, Anugerah 3K through our Drink.Move.Be Strong campaign to educate teachers, school children that milk has the vital nutrients to help one achieve more in their everyday life. Under the DMBS campaign, we have run various activities, such as nutritional talks and fun outdoor exercises in schools which has achieved over 350,000 student participations for its activities. In fact, we are targeting to reach over 1 million school children by 2020 in Malaysia,” he added. These activities educated school children on the importance of eating a balanced diet that includes milk and doing physical sports daily, to push them to adopt healthier lifestyles – and to address the growing concerns of obesity and malnutrition in children in Malaysia. For more information about Dutch Lady Malaysia’s World Milk Day celebration, visit www.dutchlady.com.my.